Where can I find flat rocks to paint? Anyone can find rocks to paint, look in your own backyard. But for most rock painters, finding smooth flat-top rocks are most desirable for painting mini masterpieces. Public areas such as city parks and hiking trails are a great place to find rocks. It’s against the law to remove rocks or even leave painted rocks in State and National parks. Home Improvement Stores i.e. Lowes or Home Depot will sell landscaping rocks in bags. When looking for rocks to paint at these places, look for Gray Mexican Beach Pebbles or White Caribbean Beach Pebbles. I have used both and will have a variety of sizes. Local Garden or Rock Yards businesses. These are great places to find your ideal rocks for painting. It’s best to bring your own bucket, most of these businesses have rocks in bins so you can choose your rocks and amount you want. Last but not least Amazon. Yes, Amazon will literally sell you rocks too. I have actually purchased rocks from this company and the rocks I received were round, smooth with flat tops, perfect for painting. Below is the link to purchase these rocks and my YouTube unboxing video to see what I actually got. I thought it was a great time-saving option. How can I make a rock smoother for painting? You can use any wood filler to make rocks smoother for painting. After the filler is dry, sand the rocks with a light grit sandpaper, then apply a base coat of acrylic paint. What kind of paint should I use on rocks? Acrylics are the most common paint to use on rocks. It’s water-based and fast drying and is sold almost everywhere. Acrylic Craft Paint brands are popular for beginners because of the hundreds of color selections to choose from. Beginner rock painters may be intimated by color mixing, so craft paint is an easy option for starting out. Acrylics are not the only option to decorate rocks with. Watercolor paints, alcohol inks, crayons, chalk, and oil pastels are just some other ways to paint rocks. The options are endless. To learn more about using alcohol inks on rocks, read this beginner tutorial, here. Is applying a base coat really necessary? 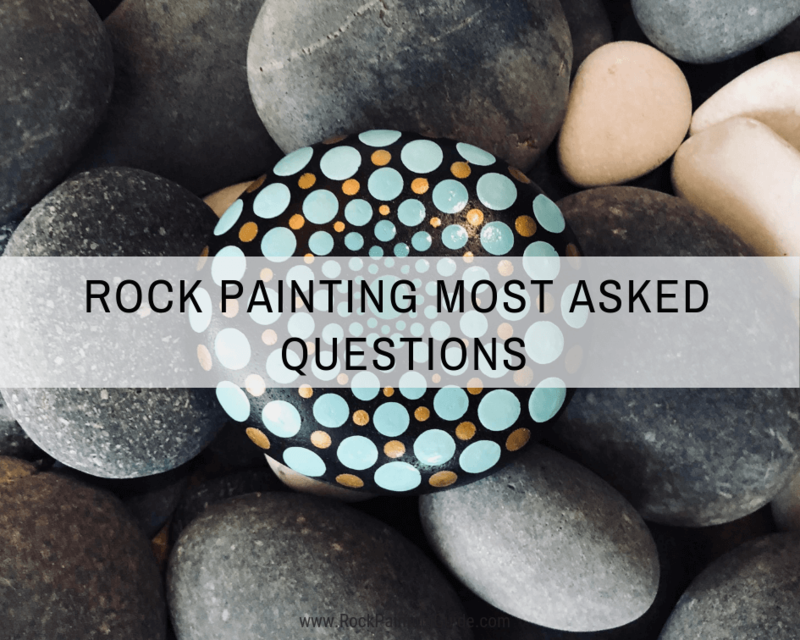 No, but I find that using a white base coat on gray rocks, can make the colors more vivid and require fewer coats of paint. When using alcohol inks on rocks, I will base coat my rocks white. It helps seal the rocks since it’s a porous material. Alcohol inks are meant to be used on non-porous surfaces, so sealing rocks with a base coat will provide a non-porous surface to paint. Simply a paintbrush and paint. Okay, I know you want more of an answer than that! Rock Painting is becoming so popular now that, more and more products are being made to meet this demand! Here are a few items that are great for rock painting and all products can be found in the Art Toolbox Essentials page. How long to should I wait before sealing my painted rocks? I recommend waiting 24 hours before sealing your painted rocks and 48 hours for paint-pouring rocks. I have sealed my rocks sooner than 24 hours but it really depends, the type of paint and number of paint layers. 24 hours has always been a safe number for me. Who wants a beautiful painted rock ruined by sealing too early! Do I need to seal my rocks? I highly recommend that you do seal your painted rocks. Sealing will protect your artwork from the outdoor elements, creates a moisture barrier, and protects from scratches and nicks. Sealer: Spray or Paint on? It really depends on your preference. I prefer to use a clear glossy spray sealer. It’s cheap and easy to seal a lot of painted rocks at once. I have never had an issue with a paint bleeding issue. Make sure it’s an outdoor weather resistant and offers UV protection to guard against yellowing. Safety Tip: Spray your rocks outside. The spray emits strong odors. Spray at least 12 inches away in a sweeping motion to give it an even coat. Begin with a quick light coat and gradually adding another coat or 2. Then depending on the humidity, wait at least 24 hours before touching the rocks. I live in a humid region so I need to wait a full 24 hours before touching my little creations. Paint on Sealers is fine for rocks that will not be placed outside and in the sun. Mod Podge makes a sealer for acrylic paint, but I don’t recommend it for painted rocks that will go outside. How do I trace an image on a rock if I’m not a great artist? Transfer graphite paper is an excellent option for tracing images or words on rocks. See my Hand-Lettering Tutorial using transfer tracing paper. 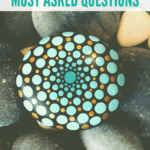 I love Mandala art, but is it beginner-friendly? Yes, anyone can do mandala art. I suggest starting with a simple mandala art dot pattern. You can use dotting tools to create a variety of dot sizes for your design. Here’s a great YouTube tutorial for beginner mandala dot art. How to choose colors for my Mandala dot art? What’s the best paint consistency for dot art? Acrylic paint that has a thick consistency like yogurt. Your artwork may run if the paint is too thin. Uh-Oh! How do I remove paint from my clothes? I love this hack! Try using 91% Isopropyl Rubbing Alcohol to remove dried acrylic paint from clothing. Soak the stained area for 15 minutes and then scrape with a butter knife or old toothbrush. Repeat process until the stain is removed. How do I remove dried paint from my paintbrush? Place 2 tablespoons of hand sanitizer gel in a cup and swirl your old paint brush around to loosen and melt the old paint off your paintbrushes. This will make it easier to separate the bristles to remove paint, rinse it well.